This was an eight night cruise from Cape Liberty, New Jersey (New York harbor) to Port Canaveral, Miami and Nassau. ​It is axiomatic in the cruise industry that the cruise experience provided by a ship can change based on the length of the cruise and the itinerary. 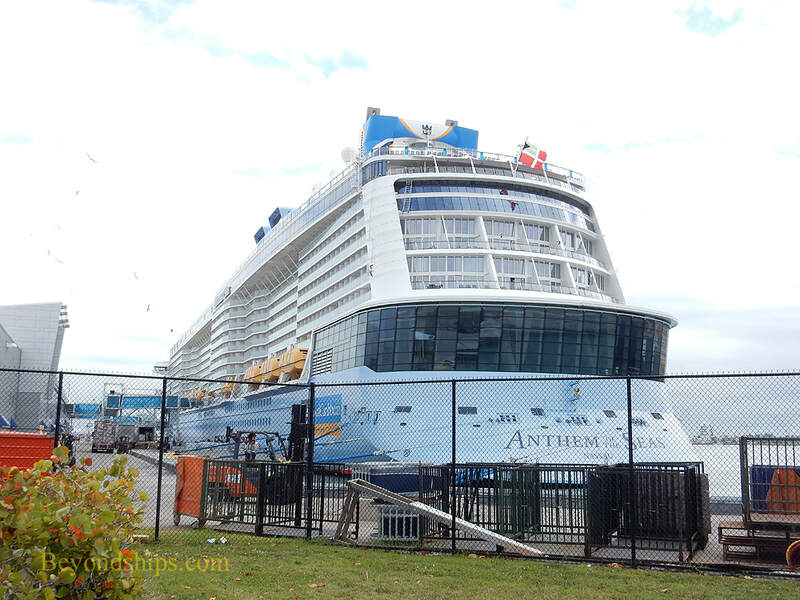 Since we had such a good experience on Anthem's 12 day Caribbean cruise earlier this year (see review), we decided to go back and see how the ship did on a shorter cruise with a different set of ports. 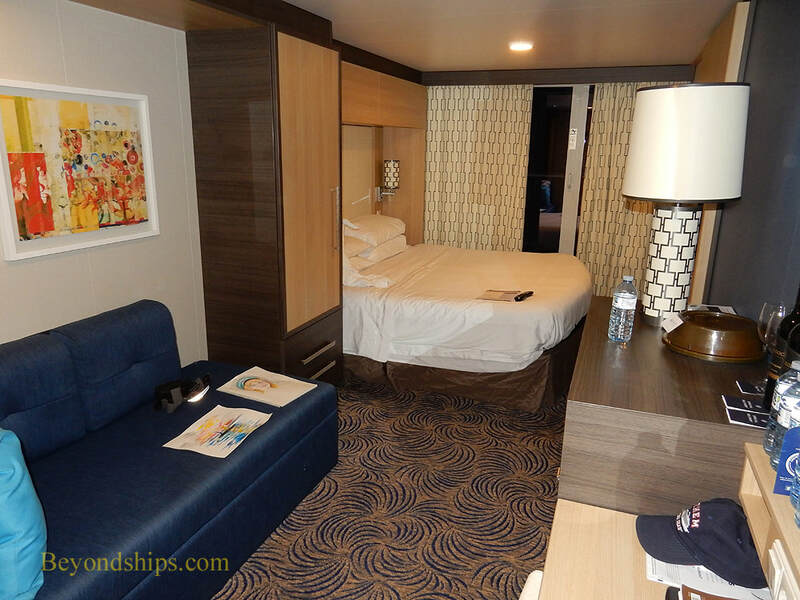 While there were several significant differences in this cruise versus our previous cruise, overall we had another very good experience on Anthem. Originally, this cruise was supposed to be a Bahamas cruise with calls at Nassau and Royal Caribbean's private island Coco Cay along with a call in Port Canaveral. However, as part of its refurbishment of Coco Cay, Royal Caribbean is building a pier so that its ships can dock at the island rather than tender passenger ashore in boats. This pier was scheduled to be completed for our cruise but a few weeks before embarkation, Royal informed passengers that the pier would not be ready in time. Since the tender facilities would be obstructed by the continuing work on the pier, Royal decided to substitute a day in Miami in place of the call at Coco Cay. Thus, the cruise became a Florida cruise with a stop in Nassau. For those passengers who were looking to spend a day at Royal's resort island, the news of this itinerary change may have been a disappointment. However, as it turned out, it was a plus for two reasons. First, the day that Anthem had been scheduled to be at Coco Cay turned out to be cold and rainy. There would have been no fun in the sun at Coco Cay that day. Second, Miami is a much richer destination – it offers cultural opportunities such as museums, has a variety of interesting neighborhoods, is close to the Everglades for eco-tourism and on sunny days, it offers a beach experience. Thus, there was much more to see and do. With dynamic ports such as Miami, Port Canaveral, Key West, Charleston, and Norfork, to name a few, along the East Coast of the United States, one might well ask why the major cruise lines do not offer all-American cruises down the East Coast. The answer is that they are not allowed to offer such itineraries. Back in the 19th century, Congress enacted the Passenger Vessel Services Act which prohibits foreign-flag vessels from doing all-American itineraries. (This law is often confused with the Jones Act which prohibits foreign-flagged cargo ships from making all-American itineraries). The idea was to protect American shipping from foreign competition. Since all large cruise ships (with the exception of NCL's Pride of America) are foreign-flagged, the major cruise lines cannot offer East Coast cruises that only consist of calls in U.S. ports. You might well say that even though their ships fly flags of convenience, the three largest cruise lines (Carnival Corporation, Royal Caribbean Cruise Lines Limited, and Norwegian Cruise Lines Holdings) as well as Disney are headquartered in the United States. Therefore, this old law is actually placing restrictions on American businesses - - the entities that the law was enacted to protect. Furthermore, if all cruise ships could freely call at the U.S. cities along the East Coast, those cities would benefit from the tourism. For such reasons, bills seeking to repeal or modify the Passenger Vessel Services Act have been introduced over the years but since it is not high on anyone's agenda, they never are enacted. Returning to the instant cruise, both the original itinerary and the modified itinerary kept Anthem further north than in the longer Caribbean cruise. 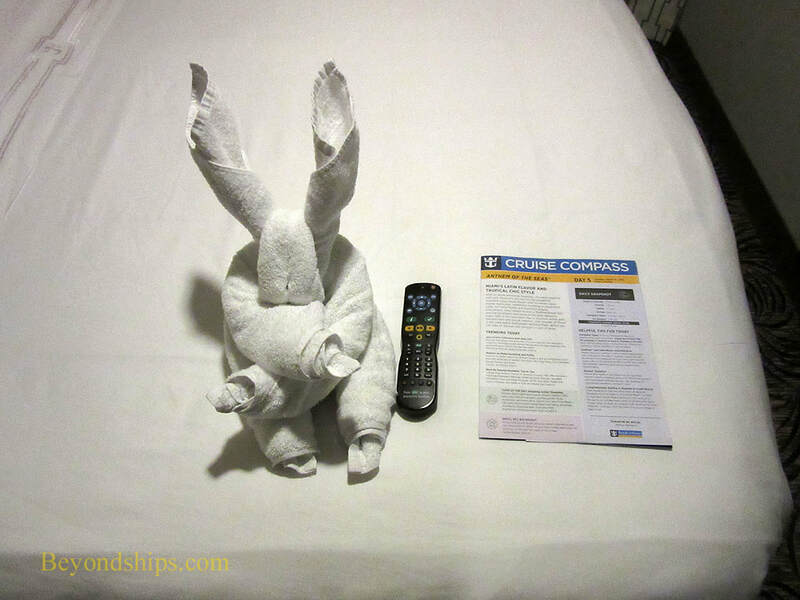 As a result, there were no really hot days on this cruise like you often have in the Caribbean. By the second day, the weather was significantly warmer than it had been on the frigid day Anthem left Cape Liberty but overall, the weather was more Spring-like than summer-like. Speaking of the weather, Anthem encountered some storms during the voyage. However, the ship handled them well with little movement. A barometer of a cruise ship's seakeeping abilities is the number of people who are out and about the ship in the ship's public areas during a storm. You do not see anyone out and about if the movement is actually bad. Here, the public areas were being fully utilized throughout the cruise. Anthem is not an ocean liner but she was designed to provide an enjoyable cruise experience in the typical winter weather conditions along the East Coast. That is why such a large percentage of her upper decks are enclosed. Passengers can use the indoor pools and facilities regardless of the rain or temperature outside. As discussed in past reviews, we have enjoyed the specialty restaurants on Anthem, particularly Chops Grille and Jamie's Italian. However, on this cruise, we wanted to see how it would be to dine every night in one of the four main dining rooms. For dinner, Royal Caribbean offers a choice of the traditional passenger ship dining system where you have a set table at one of the two dinner seatings or a flexible dining system where you can dine when you want but do not a guarantee of having the same table every night. Since we like the flexibility, we selected the flexible dining system. Also, in the flexible dining system, Royal makes an effort to give you a table that has the same waiters each night and they come to known your preferences. Thus, you have flexibility but also the continuity usually associated with the traditional system. We like to dine late in the evening. Royal Caribbean's loyalty program has a great perk for members who are Diamond-level and above - - a three-hour social gathering each evening. There are free drinks and you get to meet many interesting people. As a result, we like to dine after the Crown and Anchor gathering has ended – after 8:00 p.m.
An advantage of dining late is that the dining rooms are less crowded. If you want to dine during the peak times (roughly 6:00 to 8:00 p.m.), Royal encourages, but does not require, that you make a reservation. Since we were arriving after eight, we did not make reservations. We dined each night in Silk. This was the Asian-fusion restaurant back in the days when Anthem was experimenting with Dynamic Dining. Now, it offers the same menu as the other three main dining rooms but it still has its Asian-inspired décor. Each night, we had a table for two in the area of Silk managed by Valentin, Assistant Maitre D.' The head server was Millicent, who we knew from previous voyages on Anthem but we had not met her assistants before. In any event, the service was excellent - always attentive and friendly. The tables are arranged in Silk so that it is easy for passengers to speak to the people at the next table if all parties so desire. Unlike a large shared table, you are not expected to talk throughout the meal but can be both sociable and private. On this voyage, we met couples from England and Scotland as well as North America. The menus offered good variety. There was always something that appealed to us. As on the previous cruise, we particularly liked the fish dishes, especially the salmon offerings and the broiled swordfish, as well as the lasgana and eggplant parmesan. Several times, this resulted in having two entrees. Sous Chef Wilson came by the table several times. While he seemed to appreciate our compliments on the food, he seemed disappointed that there were no complaints i.e. no guidance about what can be improved. We suggested that they add the excellent Italian ice cream dessert tartufo to the menu, which is something we always suggest to the cruise lines but which so far none have acted upon. In sum, we had an excellent dining experience. Anthem offers three main shows: a version of the Broadway/West End show “We Will Rock You;” a musical developed by Royal Caribbean “the Gift;” and the psychedelic fantasy “Spectra's Cabaret.” The first two are performed in the theater while the third is in the 270 lounge. These shows have been on the ship since it entered service and so we will only briefly summarize what we have said about them previously. “We Will Rock You” is based on the music of Queen. Therefore, if you like Queen, you will probably like this show. It is well-performed with good theatrical qualities. “The Gift” is also well-performed but we find the plot somewhat confusing and depressing. Of the three shows, “Spectra's Cabaret” is the one we have seen most often. We like the music and the dynamic technological effects as well as the various performances. Do not try to figure out the plot - - it does not have any. It is better to sit near the front with the singers and acrobats performing and the effects happening all around you. If you sit in the back, it just seems like people doing strange things. In addition to the main shows, Anthem has shows by visiting performers including musicians and comedians. On this voyage, Miguel Washington was one of the comedians who performed. 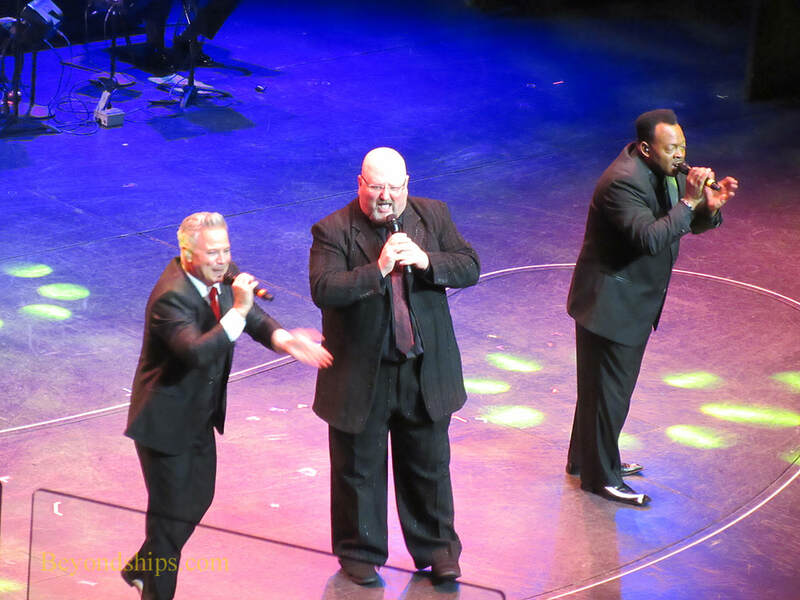 The Las Vegas Tenors, a three-man vocal group) performed popular songs. Yet another entertainment venue on Anthem is the Music Hall, which includes parts of two decks. Anthem has a tradition of having good tribute bands play some evenings in the Music Hall. Past cruises have featured Beatles and Journey tribute bands. 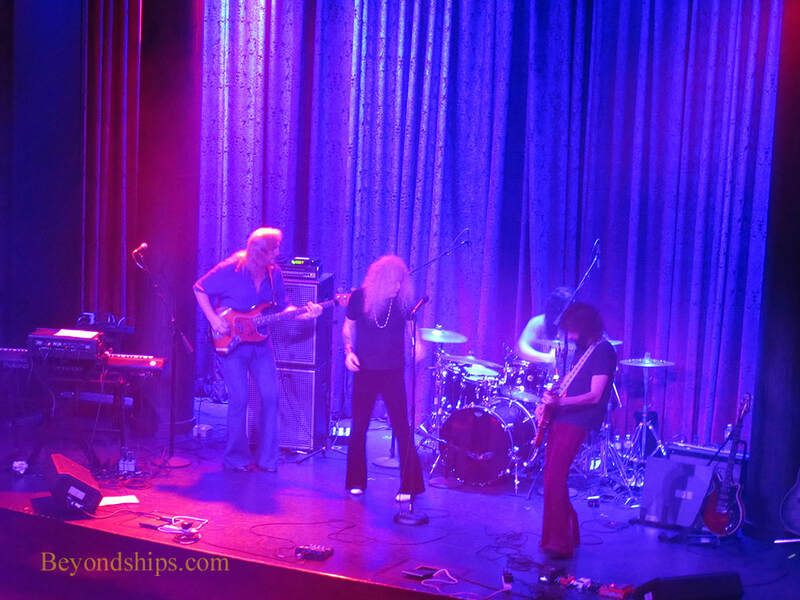 On this cruise, it was Led Zepagain, a Led Zeppelin tribute band. They performed the music well and true to the original. The show was well-received by the audience. It was not perfect, however. The sound mix was disappointing. Many years ago, I was involved with rock concerts and Led Zeppelin had a very distinctive sound dominated by Jimmy Page's roaring guitar. The sound hit you physically. Here, the rhythm section dominated and the overall sound lacked the physical hit. The solution is straightforward – greater amplification of the guitar. Anthem's Surf and Stream internet connection was good enough to qualify as an entertainment alternative. We were able to stream movies and videos to our computer and watch them in the cabin. One of the biggest differences between this cruise and the cruise earlier this year was that the average age of the passengers was younger. There were significantly more families with children on this voyage. However, Anthem absorbs children well. You did not feel that the ship was being overwhelmed by a horde of other people's kids. The ship is designed so that those seeking a family cruise and those seeking an adult cruise can both have what they are seeking without intruding on each other. Above: The Las Vegas Tenors. Below: A balcony cabin on Anthem.